American Legion National Commander Denise H. Rohan is calling on all posts, squadrons, chapters and units in the organization to do what healthy families do on a regular basis: enjoy dinner at the same table together. In addition, she is asking The American Legion Family to invite the whole community to join them for Veterans Day. “My theme as national commander this year is Family First!” Rohan said. “The American Legion Family is a very large and extended one. It includes the American Legion Auxiliary, Sons of The American Legion and Legion Riders. It also reaches into the community – National Guard and reserve troops, active-duty military personnel who might be far from home, Boy Scouts, VA staff, youth program participants and alumni, civic organizations, educators and many others. The commander added that the 2017 Family First! Veterans Day Dinner can give communities a taste of The American Legion centennial, as well. “What a great opportunity to tell the story of your post namesake, display some your art and artifacts and tell of your story of accomplishments in advance of our centennial,” Rohan said. The official centennial celebration window is September 2018 through Nov. 11, 2019, but the Family First! Veterans Day Dinners can serve as pre-function to build awareness. Meet with key groups, such as Boy Scout units, Student Veterans of America chapters, National Guard and Reserve personnel, active-duty troops, educators, coaches, business and civic leaders to make them aware of the dinner and start getting a head count. 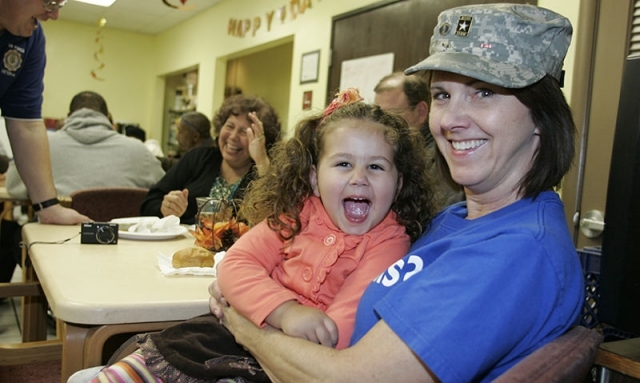 Explore opportunities to serve free or discounted Veterans Day dinners to homeless veterans, those at long-term care facilities and others who might not feel connected. Pursue local sponsorship opportunities, such as donations of food items or funds, to help offset the cost of serving up a bigger-than-ever Veterans Day dinner. Set affordable dinner prices to best attract a big crowd from beyond The American Legion Family membership. Get advance reservations to make sure there’s enough food and to have a list of potential members and supporters for later American Legion Family activities. Alert the local media about the dinner, explaining The American Legion Family’s passion to share with the community the Four Pillars of American Legion service, spread awareness about the centennial and draw attention to our programs and activities. Use the dinner as an opportunity to raise funds for Temporary Financial Assistance and The American Legion’s service officer program, both of which substantially help families. A communications toolkit, which can be localized, will soon be available online at www.legion.org/media. And use the hashtag #LegionFamilyDinner for all of your social media channels. As you host the “biggest and best” Veterans Day dinner in 2017, share photos and your story on the Legion’s website www.legiontown.org.